The tightest scheduling block I attempted was between How Green Was My Valley (see here) and this film, and I was extremely lucky to get in – I was, in fact, the LAST person into a very full theatre. I felt kind of bad (and still do, since I know several people who tried the same schedule and didn’t make it in), because this was initially a filler film on my schedule. It’s short and fit in between How Green and Hat Check Girl, the Pre-Code comedy and MOMA restoration that I expected would be my favorite discovery of the festival. For some reason I didn’t read the program carefully on this film, and I thought “the stranger” was an aging man coming home to be with his family and their struggles in accepting him. I have NO IDEA why I thought that based on this program. In the end, though, I’m very glad I did make it in, because THIS, not Hat Check Girl (though that’s fine too, post forthcoming), turned out to my gleeful discovery of the fest. Unlike the description I gave above, the story actually concerns a quick-witted and cantankerous old gentleman played by Lionel Barrymore sporting a gruff-looking beard, whose dubious excuse for a family is basically waiting around for him to die so they can take over his lucrative farm. 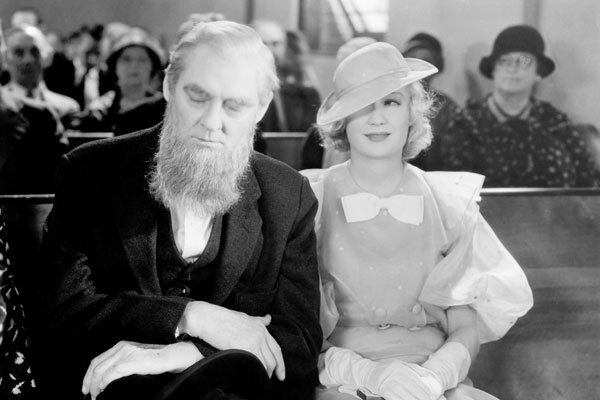 The “stranger” of the title is his orphaned granddaughter from the city (Miriam Hopkins), who has never been to the farm but is cut from the same cloth as Grandpa. Never, ever underestimate the joy of watching Lionel Barrymore do his thing on screen for an hour and a half. From the second he appears on screen (silently but pointedly refusing the healthy cereal his children have for him and cooking himself some bacon and eggs instead), he’s simply a delight, and it doesn’t matter one whit what else is or isn’t happening around him. 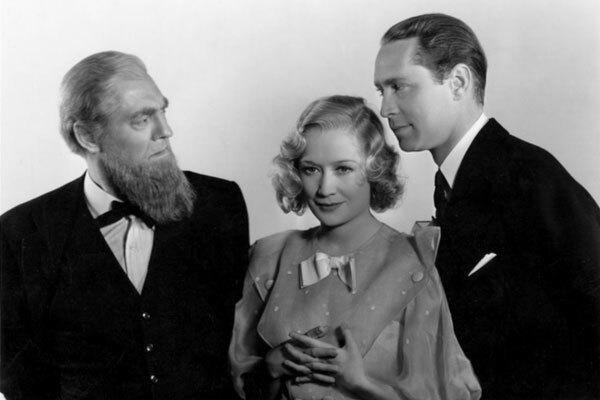 Miriam Hopkins has a whole plot where she falls in love with the married neighbor (Franchot Tone), which sounds like and often is melodrama of the most banal sort, but the film manages to keep it interesting by making the neighbor’s wife lovely and intensely likeable, so you can never quite side with the lovers, even though the film is Pre-Code and doesn’t come down nearly as harsh on them as you might expect. In addition, this plot never really takes over the film, leaving plenty of time for Barrymore to work his own subterfuge on his mendacious family. Hopkins is something of a would-be homewrecker, sure, but never underestimate her charm, either, especially in a hilarious scene where she proves her worth as a farm girl to a table full of demanding farmhands. Somehow I totally missed in the program (along with everything else) that she was even in it, so seeing her come on screen was a lovely surprise. It’d be easy to call her romance plot (subplot? I’m not even sure) a bit of a mess, but it honestly doesn’t matter. Everything around it is so winning, and Hopkins and Barrymore play off each other so wonderfully that the film is far more enjoyable and memorable than I expected. A great rediscovery for the TCM Festival, and I hope it finds its way to the channel programming and maybe a DVD release.